When explorers first set out to discover new lands, they couldn't take everything they needed with them. They packed what they could and then lived off the land once they arrived, using trees for building materials, making bricks out of clay, securing water and food from the earth. It will be no different when humans explore deeper into our solar system, using in-situ resource utilization, or ISRU - where an abundance of resources, such as water, reside in greater amounts in space than here on our home planet. The water is frozen or chemically bound to the regolith, and excavation is a crucial step in acquiring the water necessary to survive and travel in space. The 7th Annual NASA Robotic Mining Competition (RMC) is set up for college students to design and build a mining robot that can travel over a simulated Martian surface, excavate regolith - or Mars dirt - and deposit as much of it as possible into a bin, all within 10 minutes. Team members may control their bots remotely from a trailer where their only line of sight is via a computer screen, or completely autonomously, with their programming skills put to the test as their robot handles the mission on its own. Essentially, NASA is crowdsourcing ideas from inventive college students who want to be part of NASA's journey to Mars. 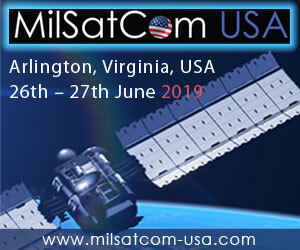 The competition, which takes place May 16-20 at the Kennedy Space Center Visitor Complex in Florida, focuses on technologies necessary to extract consumables such as oxygen and water to support human life and provide methane fuel to spacecraft. The technologies also can be used to mine source materials on-site for landing pads, buildings and even radiation shields - saving an estimated $40,000 per kilogram in transportation costs alone from the Earth's surface to low-Earth orbit. Rob Mueller, a senior technologist in the NASA Kennedy Space Center Swamp Works and head judge and co-founder of the Robotic Mining Competition, knows the value of crowdsourcing ideas. "While it takes about one year to fully develop a mining robot in a research lab, RMC showcases 50 Martian mining prototypes in just one week," said Mueller. The scoring for the mining category will require teams to consider a number of design and operation factors such as dust tolerance and projection, communications, vehicle mass, power needs and autonomy. Teams also have to keep in mind the fine and abrasive characteristics of the regolith, and the weight and size limitations of the mining robot. While the team with the most points from all categories will win a cash prize, the real reward is helping NASA solve an engineering problem and gaining critical systems engineering and robotics skills that are highly sought by employers. NASA directly benefits from RMC by seeing firsthand clever ideas and solutions that could be applied to an actual excavation device or payload - projects Swamp Works is working on today. The unique physical properties of basaltic regolith on Mars and the reduced, one-third gravity make excavation a difficult technical challenge. One critical resource on Mars is water ice, which can be found buried in the regolith where it is well insulated. During RMC, teams will have to dig for gravel under the soil surface that simulate this ice. 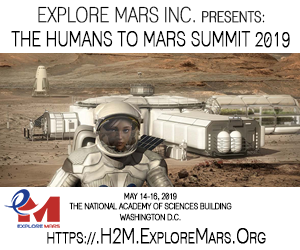 Advances in Martian mining, including those displayed every year during the competition, have the potential to significantly contribute to our nation's space exploration endeavors. Recent data from NASA Mars missions indicate a global presence of at least 5 percent water in the Martian soil. In order to obtain this water for use as life support and propellants, it must be mined and processed. Time delays in communications to Mars mean that using autonomous regolith mining robots to acquire the water resources may work better. All of these challenges are simulated in the competition. 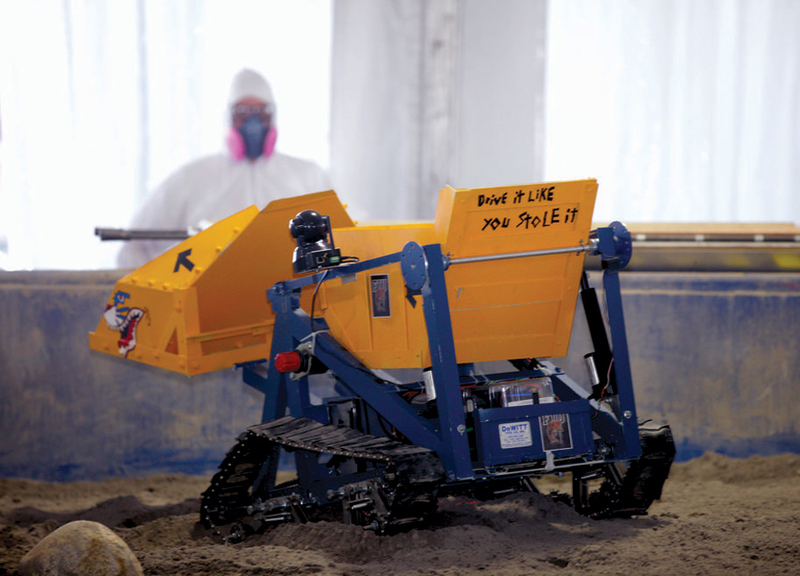 Throughout the years, engineers at Swamp Works have used what they have seen during the competition to improve their Regolith Advanced Surface Systems Operations Robot, or RASSOR. "Many teams have problems with mobility on the loose regolith, so tracks versus wheels has been a big design consideration for us," said Drew Smith, NASA lead design engineer for RASSOR. "By watching the various wheel and track designs perform, we have been able to determine that, in general, larger diameter and wider wheels are more reliable - and that has been a factor in selecting wheels for our latest prototype, RASSOR 2.0." As we embark on deep-space missions with weeks- or months-long travel times, ISRU becomes increasingly important because resupply missions are expensive and exclusively relying on them may put crews at risk. 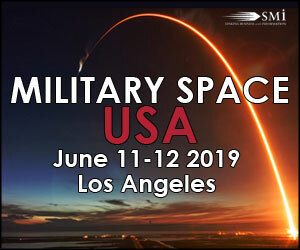 "Mission capabilities and return on investment multiply when human consumables and spacecraft propellant can be harvested from extraterrestrial environments," said Mueller. "For example, 1 kilogram on the Mars surface requires 11 kilograms to be launched into low-Earth orbit. By making propellants and consumables on Mars, we can avoid this large mass multiplier." Mueller and his team have calculated that three RASSORs could mine regolith to produce enough propellant (30 tons) to launch astronauts back into Mars orbit for the journey home on the Mars Ascent Vehicle, as well as produce water and oxygen for life support and growing plants. "Autonomous robots are becoming more common across industry on Earth and in space; tomorrow's workforce are the students that graduate today," Mueller said. "This competition trains the students using NASA systems engineering methods, which puts them in a great position to find a good job - and, of course, NASA would like to hire a few of them as well!" said Mueller. Since its inception, RMC has hosted more than 400 different robots and more than 3,000 students from across the United States, including Alaska, Hawaii and the Commonwealth of Puerto Rico. The list of teams and the competition schedule can be found at http://www.nasa.gov/offices/education/centers/kennedy/technology/nasarmc.html.